How do white ants/termites find Termite Traps? My house is only three years old. It must have been built to meet Codes including termite preventive measures, and anyway, isn’t there a seven-year builder’s warranty to cover me? Yes. And yes. Building codes, in essence, aim to ensure termites cannot enter unseen into a structure. Codes do not expect to prevent termites getting into a building, the aim is to make termite attack routes visible on the way in. Think of those old ant caps that were/are placed on piers and stumps. Termites cannot get through the metal; they have to build out around and over them where their tunnel can be seen — as long as someone goes looking. Requiring an annual inspection is almost the first paragraph of most Codes). Builders guarantees are full of loop holes. The pest control company only gives the builder a piece of paper to say they applied or installed chemical or other barriers to the appropriate Code. If you haven’t kept up the annual termite inspection (by the nominated pest company) your warrantee is void and there’s nowhere to go. Not a good idea. It takes time for scouts to find a TermiteTrap outside and then more time for the ‘construction team’ to build a tunnel to it. Then even more time to bait them. During all that time, they are still hollowing out the timbers in your house. 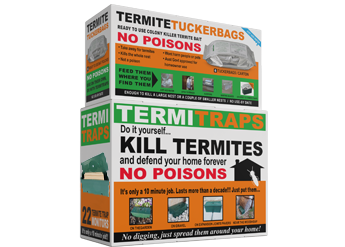 If you can find termites busy eating timbers such as skirting boards, window or door frames, it is best to directly bait them right away. Here’s the link to text and illustrations explaining the process. I’ve bought a load of firewood for the winter and found termites in it. What do I do? They will soon dry out and die because they’ve been removed from their nest. It may take a week or two depending on rain and temperature (and how busy the ants are at your place). Unless there’s a queen and a constant source of moisture, they will die. 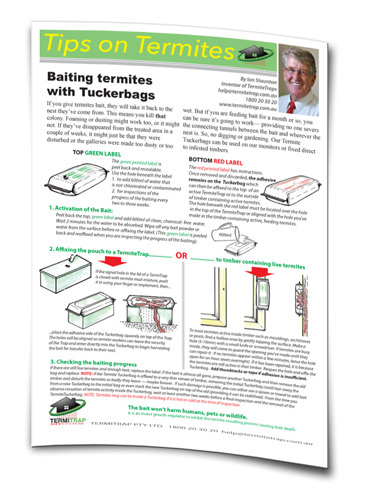 What are the dimensions of a TermiteTrap? I’ve read about ‘serious’ and ‘nuisance’ termite species. How can I tell the difference? I’m very wary of generalising, but here is an attempt to simplify, hoping you’ll recognise that in nature there are exceptions to human ‘rules’. There are 300+ termite species in Australia. Only about 10 or so species, the so-called ‘serious’ ones, contribute significantly to Australia’s annual $billion+ damage bill. These species come from just three genera (plural of genus): Coptotermes, Schedorhinotermes and Mastotermes, (Coptos, Schedos and Mastos.) The Mastos are found mainly north of the Tropic of Capricorn (between Rockhampton and Exmouth) and they are big — 13-16mm long. No other solid-wood eating termite is this big. The geography and size quickly rules them in or out as a threat to your home. The Coptos and Schedos are found all over the continent and they specialise in eating solid wood such as in our structures. Which means they definitely are a threat. The rest of the 300+ are ‘nuisances’ because they are either leaf-litter, grass, or decaying wood eaters and they usually build mounds. No one wants to live with a termite mound nearby so even the couple of species of the pointy-headed Nasutes (Nasutitermes) that will eat solid timber are easily destroyed by breaking open their mound. We have a free ID Service and there is also a section in this website that gives you some visual clues on the differences. My house was built more than twenty years ago and there has been no termite attack, why would I bother putting monitors around? The CSIRO produced a Termite Risk Map showing almost all areas of the mainland states of Australia are of Moderate to High Risk. The tiny sliver of land along the Great Ocean Road in south western Victoria is about the only Low Risk area. Which means there are serious termites near you. Annual flights of termites occur in late spring, early summer. Most are unsuccessful in establishing a nest — but some do. Ever seen flying termites at dusk at your place? Twenty years without an attack can be looked at two ways: you’ve been lucky, or, on the law of averages your luck is due to run out. Your decision rests on weighing up the cost of say $440 for 22 Traps that will last for at least 10 years; put them around as ‘sentries’ for an early warning system. That is not a lot of outlay to maybe save you $thousands in repairs. Your choice. We have lots of ants which we know are the enemy of termites. Do we still have a termite problem? Yes. 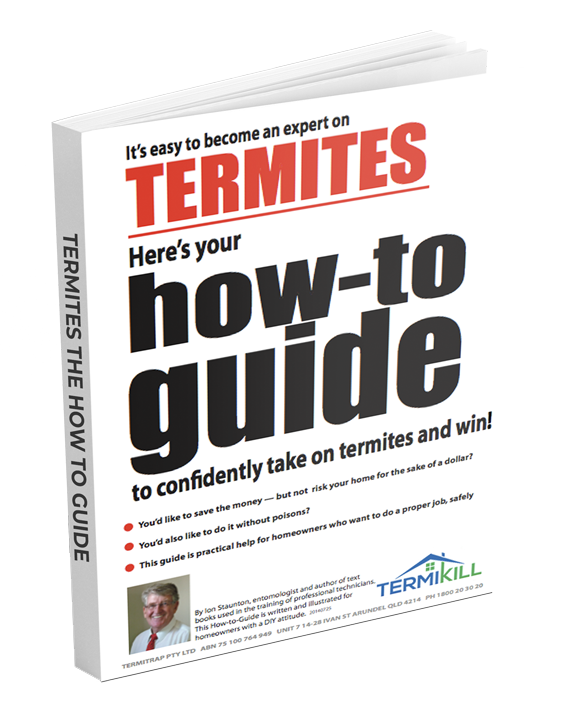 Termites are masters at excluding ants from their nests, their tunnels and the wood they are eating. They’ve been doing it since ants evolved. (Termites were here before ants). Won’t dogs or kids move the Traps? If you place the Termite Traps around the house with the dog locked in the garage or the car where it can’t see you put the Traps down, there is no reason for the dog to believe they are a movable plaything. When you let the pooch loose, some investigatory sniffing may occur but as it doesn’t play back, the Trap will probably be ignored. In all our trials and after all the cartons we’ve sent out, only one dog story has come back to us. (The Trap was placed inside the dog pen). As for kids? They are supposed to leave things alone if they are told, so tell them. After all, you have your home investment to protect. Yes (and no). Yes. If when you receive the product, you change your mind or have second thoughts that it is not what you expected, you can return to us for a full refund — no arguments from us. Just phone to say it’s coming back and to arrange the repayment details. No. we don’t guarantee results that we cannot control such as where you placed them and how you baited them or, whether you misinterpreted instructions. And it is very difficult to prove in court (many have tried) whether termites were already inside a structure before monitors were put in place.